Last Friday Dan and I worked on accessing a user’s Google Docs via OAuth. We were able to make it work except that I found out that our solution doesn’t scale! 1. Two or more users getting an unauthorized request token returns an invalid token to one of the users. 2. Two or more users getting an unauthorized request token in succession returns an invalid token to the last person who requests. The latter can try again after a certain time after the last person has finished accessing his/her google docs. 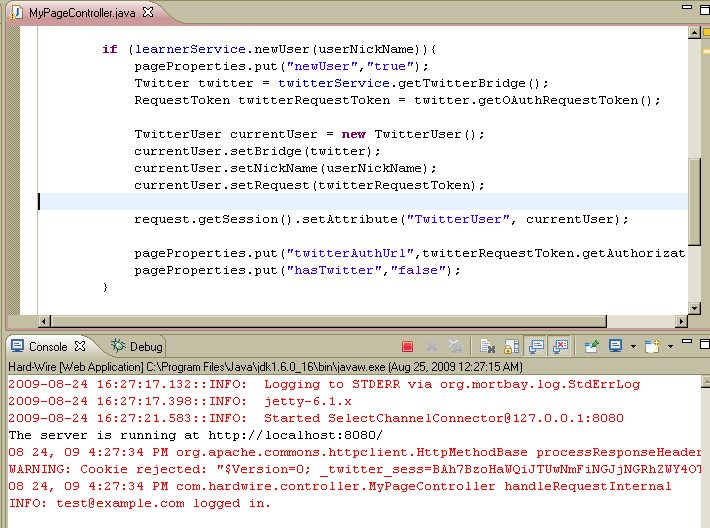 We followed are the tutorials for accessing Gdata using Oauth at the Gdata website and used the Gdata Java libraries. 1. that the helper classes that come in with the libraries are instantiated only once for the whole app (a singleton). Meaning any client who visits the app and uses the same instance to connect to google via oauth uses the same instance every time. 2. the helper classes are maintaining state, hence the invalid token received by another user while someone is still “using” our app to access his/her google docs. This is the same problem that I have with using Twitter4j, you can’t wire them as a singleton because they’re maintaining state. and refactor this by instantiating one instance of GoogleOAuthParameters and GoogleOAuthHelper per invokation of any of the methods in the controllers that make use of them. I’ll be able to do this using the abstract factory method or an abstract factory class which I’ve just finished reading about this week! That came at just the right time, thank God for my book Head First Design patterns. But which refactoring to do? I think the abstract factory method is more appropriate although it shouldn’t be called abstract because I don’t expect any controller to extend the controller I am going to build for Oauth. I’ll call my solution the oauth-factory-method. But on the other hand, I might need the same functionality of the oauth-factory-method so that oauth controllers that have provider specific logic can use the oauth-factory-method to get the helper classes that they need and more importantly that are otherwise needed in a lot of other controllers. How do you unit test Oauth Controllers? I like Spring MVC because you can unit test your controllers. No need to start and stop your application server from time to time and see what happens — if the controller actually gets this set of data you want and puts them in the model. I was particularly fascinated with using mock requests and response objects that you can pass to the controllers so you can invoke say their handleRequestInternal method, get the ModelAndView and see if the model contains the info you need:. But testing Oauth controllers is another thing. For instance if I want to get the authorization url because I want to Oauth to GData, I would have to deploy the web-app because Google will only accept authorization requests from my domain (the url of my web app), not my development environment whose domain is localhost:8080. So right now the only way I am testing if my code works is deploying the code and printing out the data that I need to have printed. Pretty old school if you ask me. In my previous post I tried to store the RequestToken and Twitter instantiations to the Appengine’s datastore so I can use it in the callback url after the user authorises Twitter. But apparently the appengine datastore doesn’t support the RequestToken Class. My next solution: put both instantiations in the session so I can access it in when the user is redirected to the callback url or from my(the developer’s) pov, so that I can access it in the controller class (no not the servlet I am using Spring btw). So far I’ve been able to load the page and that means I was able to store it in the session, log returns no errors! I have no idea right now how to test views in Spring, I hope I did so the debugging I am doing here will rely more on logging. Next step is to set the callback url to a controller to access it from there. Watch this space! Update: Unit tested storing an access token to see if the datastore accepts it. Below is a list of our main sources for Projectrix (one per concept) and a short summary for Portfolios, OAuth and Common Tags.